All of you have have been in this situation before: a long distance, cross-country journey by car. If you happen to be driving through France, make sure to stay away from the Autoroute and use the Route Nationale instead. I bet you – it will never be boring! Driving home from the 24 Heures du Mans, we stopped at a red traffic light in Sedan (Ardennes), not far from the border to Belgium. 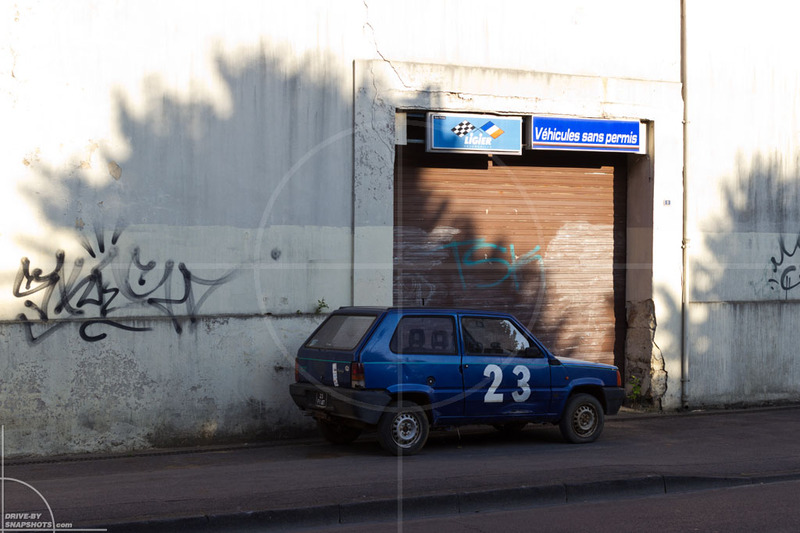 The low sun cast an interesting shadow on the wall, in front of which a FIAT Panda was parked on the sidewalk. Not really interesting, you think? Well look closely, and you will see what instantly hit me. Just stating the facts is indeed boring. Cars parking on the sidewalk are a rather common sight in France. But look at the details! The building doesn’t have a single window, but only the garage door blocked by the car. The walls have been painted multiple times, only to be spoiled again by tagging, sprayed with an almost empty rattle can. 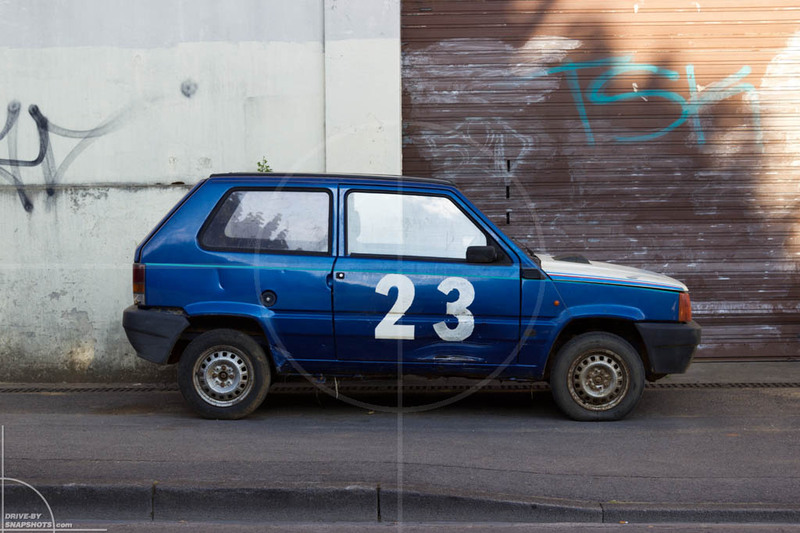 The car itself is a FIAT Panda Mk1, sporting a more than interesting license plate: 23 FIAT. This is neither a regularly sized French license plate, nor do the French have vanity plates there. This hints at a véhicule sans permis conversion, meaning it has less power and a lower top speed than a regular Panda. These vehicles do not require a regular drivers license. This particular example looked like it had a tough life and is in a very sorry state by now, with scratches and dents everywhere. The bonnet has been replaced with a mismatched white one, the rear bumper is about to fall off and the wiper blade was stolen long ago. It may have been scheduled for a service, but it seems like the dealer went out of business long time ago and just forgot about the car waiting outside the back door. But what caught my attention to this scene in the first place? 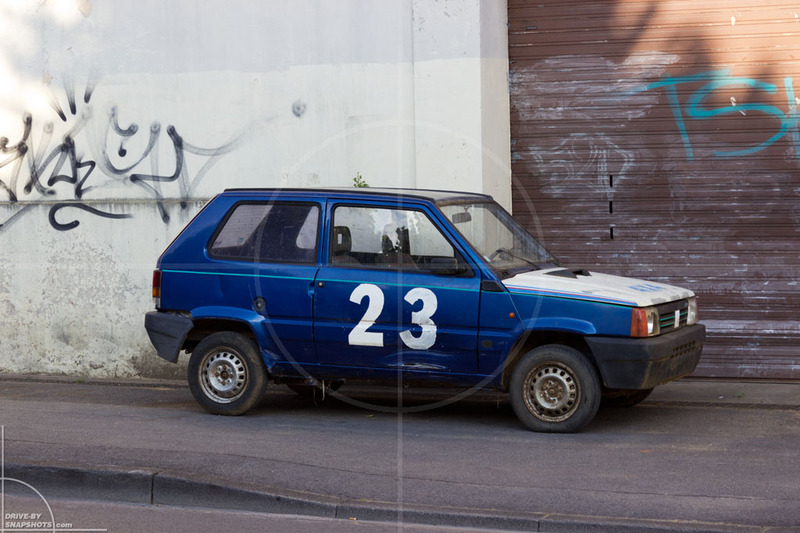 Well, the fact that a véhicule sans permis would have a starting number painted on the doors is very odd, isn’t it?